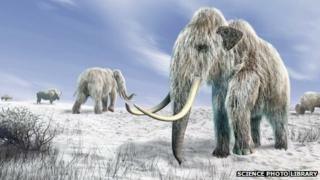 A 42,000-year-old baby woolly mammoth has been loaned to Manchester Museum for a new exhibition about Siberia. The female, which has been named Masha, was discovered in 1988 after being preserved in permafrost soil for thousands of years. She will be on display along with other artefacts including ivory, which belong to the Zoological Museum of the Russian Academy of Sciences in St Petersburg. Siberia: At the Edge of the World opens from 4 October. Woolly mammoths, Mammathus primigenius, were common across Siberia until the late Pleistocene era, or the ice age about 126,000 to 12,000 years ago. Masha is about 53in (135cm) long and 26in (67cm) tall and died aged between one to three months. She will be shown alongside a woolly mammoth model from the Natural History Museum in London. Objects such as tusks and carvings and taxidermy animals including a brown bear, reindeer, wolverine and rare birds will also be on display. Nick Merriman, director of Manchester Museum said: "It is the first time Siberian culture and environment has been on show in the UK and it includes some rare items, not least the preserved baby mammoth."